Soiling, the loss of PV module power output due to accumulation of dirt and/or snow on the panel surface, has become one of the most important operational issues of solar energy power plant performance. 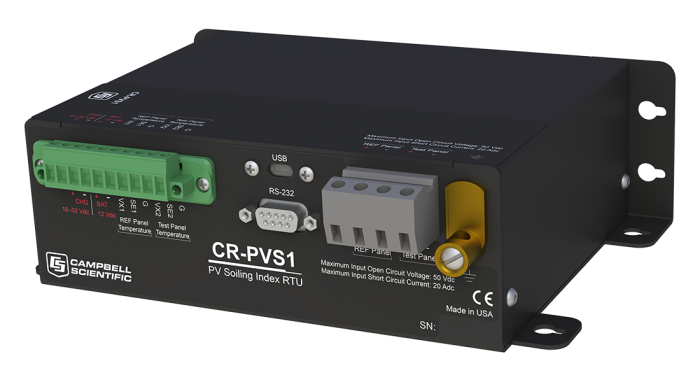 The CR-PVS1 Soiling Index RTU provides solar energy professionals who are responsible for managing the performance of a PV power plant with the information needed to evaluate and manage the impact of soiling. Soiling loss indices are calculated using industry standard methodologies. Raw data is stored and available for additional post-processing. The CR-PVS1 Soiling Index RTU is designed to be at the heart of an independent soiling measurement station or as an add-on peripheral to any new or existing MET station. It supports many communication protocols such as Modbus, DNP3, PakBus, PakBus encryption, and several Internet protocols. Deployment/configuration is simple and easy. The CR-PVS1 is delivered field ready and requires no programming. It will work with any user-supplied solar module up to 300 W, or it can be ordered with mini 20 W modules. Two highly accurate and rugged back-of-temperature sensors are included. Soiling loss index is calculated from short-circuit and back-of-module temperature measurements of a reference module that is kept clean and a test module that is kept dirty. Measurements are made only when certain characteristics of global solar irradiance and temperature are met, avoiding any difference in soiling due to environmental instability, cloud influence, zenith angle of the sun, module current dependence on irradiance level, and to an extent, spectral effects. A quality factor is calculated to give the user some feedback on the number of qualified measurements. From short-circuit current and back-of-module temperature, the effective irradiance of each module is calculated in accordance with IEC 60904 and a soiling loss index is calculated. A daily average soiling loss index is calculated, available for SCADA, and stored in on-board memory. For immediate feedback, a real-time soiling loss index and quality factor are available. Raw measured data are stored and available for the analyst or researcher looking to perform independent post-processing. The procedure is straight forward and easily implemented with manual washing of the reference module, usually cleaned at the same time as the on-site pyranometer(s). -NOTE- All CR-PVS1 RTUs are tested and guaranteed to meet electrical specifications in a standard -40° to +70°C non-condensing environment. Recalibration is recommended every three years. System configuration and critical specifications should be confirmed with Campbell Scientific before purchase. CE All terminals tested to Class 4 levels (IEC 61000-4-5: 2013) for surge and (IEC 61000-4-2:2008) for ESD.